Se ha dicho que la diferencia principal entre ganadores y perdedores es su perspectiva. La mejor posibilidad de tener exito en el negocio, en el gobierno, en la familia en cualquier ambito de la vida es desarrollar una perspectiva que mejore la que ya traemos a la mesa. Esa perspectiva unica es una perspectiva dirigida por la sabiduria. El empresario y lider civico Dale Bronner ha estudiado, probado, y aplicado los principios de la sabiduria. Con la vision que ha recibido, ha ayudado a miles a aprender como expresar al maximo sus capacidades. 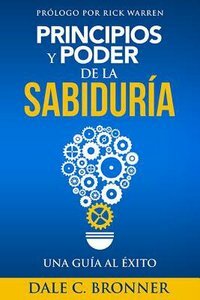 Principios y Poder de la Sabiduria te guia hacia los innumerables beneficios de la vida dirigida por la sabiduria, demostrando por que la sabiduria es "lo principal." It has been said that the primary difference between winners and losers is their perspective. The best chance of real success in business, in government, in the family in any realm of life-is to develop a perspective that will enhance what we already bring to the table. That unique outlook is a wisdom-driven perspective. Businessman and civic leader Dr. Dale Bronner has studied, tested, and applied the principles of wisdom. With the insights he has gleaned, he has helped thousands learn how to realize their maximum capacities. Power Principles guides you into the countless benefits of the wisdom-driven life, demonstrating why wisdom is the "principle thing." About "Principios Y Poder De La Sabiduria Una Guia All Exito (Power Principles)"
Bishop Dale C. Bronner is the founder/senior pastor of Word of Faith Family Worship Cathedral in Atlanta, Georgia, an interdenominational ministry founded in 1991 and now thriving with more than 19,000 members. Many regard Bishop Bronner as a leader's leader. He is a sought-after conference speaker, a leadership trainer, and the author of Get A Grip (1996), Guard Your Gates (2002), A Check Up From the Neck Up (2003), Treasure Your Silent Years (2004), Home Remedies (2005), and Pass the Baton (2006). Bishop Bronner's message reaches millions daily through his international multimedia broadcast. Richard Duane Warren was born in San Jose, California 28 January 1954, the son of a Baptist minister, James Warren. Rick earned a Bachelor of Arts from California Baptist University, a Master of Divinity from Southwestern Theological Seminary, and a Doctor of Ministry from Fuller Theological Seminary. Rick felt called to full-time ministry when he was still an undergraduate, and was actively involved in student Christian groups. He and his wife Kay - married since 1975 - founded Saddleback Church in 1980 when he was just 26 years old, with a congregation of 200 attenders. In the decades since, Saddleback has grown phenomenally; it now has an average attendance of 20,000 a week, and the influence of its ministry style and resources has extended worldwide. Rick is still the senior pastor at Saddleback, where he is known as Papa Rick - a voice of wisdom, hope, encouragement, and vision. Since 2005, he and his wife have given away 90% of their income, due to the extraordinary success of his publications. Pastor Rick took the lessons he learned building up Saddleback and distilled them into a fivefold ministry approach called 'Purpose Driven'. Zondervan's 1995 publication of Rick's The Purpose Driven Church was a huge bestseller, and Saddleback became a model for churches everywhere. This was followed in 2002 by The Purpose Driven Life - a 40-day devotional that would sell over 30 million copies in five years. In 2004, Pastor Rick was invited to Rwanda by its president Paul Kagame, who had read The Purpose Driven Life and wanted to make his country a 'purpose driven nation'. This trip changed the trajectory of Pastor Rick's life and mission. God gave him a vision for The PEACE Plan, a mission to fight the five giants of spiritual emptiness, self-serving leadership, poverty, pandemic disease, and illiteracy that devastate the lives of men, women, and children around the world. Rick and Kay consider it their life's work to empower local churches and local leaders to create sustainable change that gives a voice to the voiceless and help to the helpless. To date, PEACE teams have participated in missions outreach in every nation of the world. Rick and Kay have used the PEACE platform to advocate for HIV/AIDS sufferers globally, mobilizing local churches to help prevent the spread of the disease and to care for those already affected. In the decades since founding Saddleback Church, Pastor Rick has become one of the most respected and influential pastors in the US. He mentors young leaders, and many of today's leading pastors credit him and The Purpose Driven Church for inspiring them to pursue their own callings to ministry. As pastor to pastors, Rick has built the Purpose Driven Network, a global alliance of pastors from more than 160 countries and hundreds of denominations and has also founded Pastors.com - an online interactive community that provides sermons, forums, and other practice resources for pastors. Rick and Kay have three adult children and four grandchildren. Their youngest son Matthew took his own life in 2013 after a long struggle with mental illness. Rick has been active in recent years seeking to build awareness in the church with regard to mental illness.